Just as a delicate balance of ingredients determines the tastiness of a cookie or cake, the specific ratio of metals in an alloy determines desirable qualities of the new metal, such as improved strength or lightness. A new class of alloys, called high entropy alloys, is unique in that these alloys contain five or more elements mixed evenly in near equal concentrations and have shown exceptional engineering properties, such as high strength at elevated temperatures. Alloys more typically are made up of two or three metals. A team of researchers at Oak Ridge National Laboratory (ORNL) and the University of Tennessee, Knoxville (UT), has found that this class of alloy retains enhanced mechanical properties even when the mixing is uneven or disordered, which opens up new possibilities for future alloy design. In a study recently published in the journal Nature Communications, the team—led by Louis Santodonato of ORNL, Yang Zhang of the University of Illinois at Urbana-Champaign, and Peter Liaw of UT—focused on the structural evolution of the alloy Al1.3CoCrCuFeNi, from the high-temperature liquid to room temperature. They observed the phase transition of the material as it cooled, including the disordered and partially ordered solid solution structures. To study the alloy, the team used neutron diffraction at the Spallation Neutron Source, X-ray diffraction at the Argonne National Laboratory Advanced Photon Source, electron microscopy at the ORNL Center for Nanophase Materials Sciences—all User Facilities operated by DOE’s Office of Science—and computational simulations done at DOE’s National Energy Technology Laboratory. To perform the neutron measurements, the team had to levitate the sample and heat it with a high-powered laser. The levitation system is made of a special nozzle designed to produce a gas flow that can trap a small bead of material—about an eighth of an inch in diameter—floating in air above the nozzle. The levitation ensures the sample is not in contact with any solid surface that would melt, react with, and contaminate the sample at these temperatures, while a laser is used to heat the sample as it floats on the gas flow. “Together these techniques helped us sort out the real-world atomic mixing that deviates from the standard case, and neutrons helped us detect and understand the deviations,” Santodonato said. The novel part of this work is neutron scattering and, in particular, the ability to follow the evolution of the alloy’s atomic structure as it cools from the molten state. “Additionally, the microscopy tells us the larger scale structure of the material, and the simulation shows excellent comparisons to the experimental data,” Zhang said. 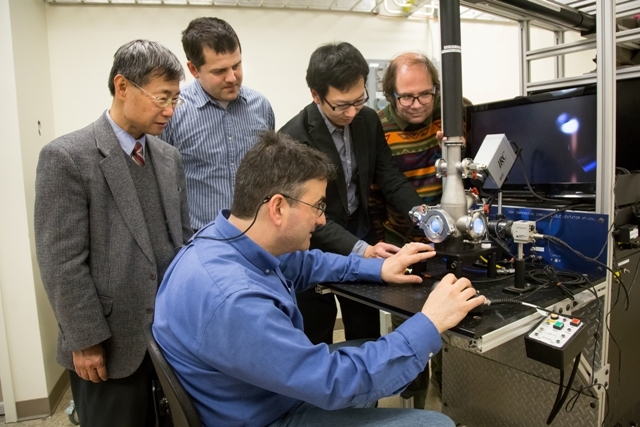 The team hopes their results open vast possibilities for future alloy designs, including understanding how high entropy alloys may be used in radiation shielding applications. “In the future, we may be able to test how the material’s structure responds in a high-radiation environment,” Liaw said. Work was performed at the ORNL Spallation Neutron Source’s POWGEN and NOMAD instruments. UT-Battelle manages ORNL for the Department of Energy's Office of Science. The Office of Science is the single largest supporter of basic research in the physical sciences in the United States, and is working to address some of the most pressing challenges of our time. For more information, please visit http://science.energy.gov/.